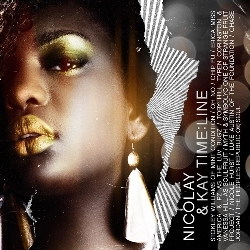 Time:Line finds Nicolay reinvigorated. If the Dutch emigré’s last album, 2006’s Here, found his mellow soul productions meandering and clichéd, then this new collaboration recaptures the spark that made his Foreign Exchange with Little Brother’s Phonte Coleman a near-classic. On a majority of Time:Line‘s twelve tracks, he bolsters his melodies with hard drums and crisp, engaging hooks. For “What We Live,” he adds a wintry horn call that recalls Thom Bell’s work with the Stylistics. On “I’ve Seen Rivers,” he uses a wandering piano riff; “Grand Theft Auto” builds around a chopped-up horn section. Only “Tight Eyes,” with its watery groove, reverts to neo-soul bliss that Nicolay’s known for. The variety of sounds, however, makes “Tight Eyes” a highlight amidst a dynamic set of tracks. Not every song is perfect — early in the album, he stumbles with the offbeat and confusing stutter-beat of the title track. But he proves to be consistently creative as Time:Line unfolds, and the music expands around his imagination. As the primary vocalist, Kay (best known for his work with the Foundation and sundry releases on Rappersiknow.com) doesn’t deliver as winning a performance as Nicolay. He drops plenty of jewels, slipping into the mind of a car thief on “Grand Theft Auto” and seducing the titular goddess of “Tight Eyes.” But his voice and cadence is a little blown out. He sounds like he’s in constant freestyle mode; like Black Thought, his ideas feel rushed. To his credit, though, he adds an edge to Nicolay’s sometimes-smooth production. These songs feel like hip-hop, not neo-soul masquerading as rap. Time:Line won’t amaze jaded fans with super-original beats and minimalist crack raps — that’s not what Nicolay does. However, you can hear a unique personality in his music. Coupled with the fact that many of these songs, particularly “What We Live” and “Grand Theft Auto,” just sound good, that makes Time:Line stand out. This entry was posted in Reviews and tagged Kay, Nicolay. Bookmark the permalink.